These schools have met twice with Michigan winning the 2002 Outback bowl, 38-30 (-1) and the 2007 Capital One bowl, 41-35 (+11). The Wolverines are back in the post season for the fifth time in the last six years after missing out last year. Their last Citrus bowl appearance was a 45-17 (+3) loss to Tennessee in 2001. Head coach Jim Harbaugh was 1-1 SU/ATS in bowl games while the head coach at Stanford. Florida is bowling for the 24th time in the last 25 years. The Gators beat East Carolina, 28-20 (-7) in Last years Birmingham Bowl, despite being outgained 536-339. Head coach Jim McElwain was 1-0 SU/0-1 ATS as the head coach at Colorado State. Florida returned just 11 starters and brought in a new head coach with new schemes. Offensive coordinator Doug Nussmeier had the same role with Michigan last year. The Gators began the season 6-0 with redshirt freshman quarterback Will Grier and a defense that McElwain claimed reminded him of Alabama when he was there from 2008-2011. Grier was then suspended (failed drug test) before the LSU game and Treon Harris took over. They lost to LSU, but won the rest of their regular season SEC games, despite poor quarterback play. Florida needed overtime to defeat a three win Florida Atlantic squad and then were embarrassed by Florida State before getting thumped in the SEC Championship game. The Gators only averaged 231 yards per game in their last three contests, but are No. 6 in the FBS on defense, holding their opponents to 111 yards per game less then their average. Michigan had a home-run hire in Harbaugh and had 15 returning starters from a 5-7 team. The players bought into Harbaugh’s intense antics. They lost their opener at Utah, but gained respect with their physical play. At 5-1 they were hosting eventual Big Ten Champion Michigan State and appeared to have the game won, but lost when their punter mishandled a last second snap and they lost a game they never trailed a second of in regulation. They then won four straight, but were embarrassed in “The Game” against arch-rival Ohio State. They are No. 4 in the FBS, holding their opponents to 116 yards per game less then their average. 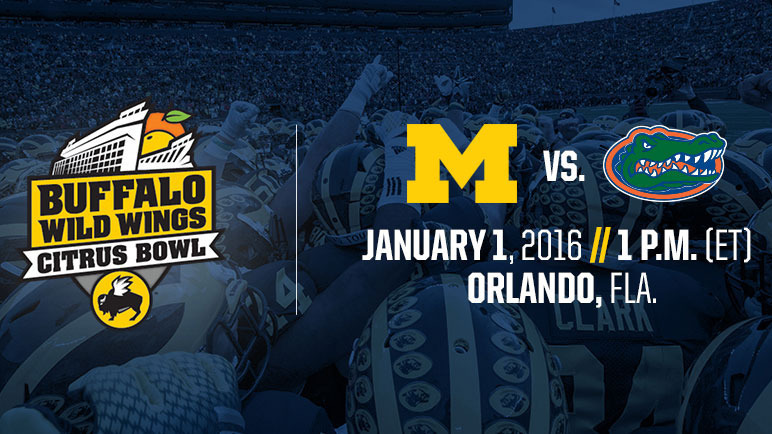 Gainesville is only 112 miles away from this venue, but the Michigan faithful will travel well. Both teams feature average offenses, but top ten defenses. The Wolverines are better on special teams and Harbaugh has more experience as a head coach in big games. Since the loss of Senior nose tackle Ryan Glasgow, Michigan has given up over 300 yards rushing against Indiana and Ohio State. This should be a low scoring game.